Hi there…so glad you could stop by. Want to see what I've been working on? I had the most fun putting together my mixed metals table setting for entertaining this holiday season. I'm slowly checking off items on my Holiday to-do list. It's getting to the point where I'm having fun cooking, baking, entertaining, shopping, wrapping and decorating. Are you there yet? So I was more than a little excited to jump feet first when Chloe's Tablescape Blog Hop came around. Chloe has organized 28 of us this week to showcase our Holiday Tablescapes…a bit like herding cats, but maybe a tad more difficult…maybe more like herding elves while they are wrapping presents, drinking spiked eggnog, eating too many cookies and decorating their home… all at the same time. This mixed metals table setting all started with a footed copper bowl/pot that I picked up at the thrift store several weeks back. Of course, now that I'm writing this I realize that I don't have a picture of the copper bowl/pot unadorned, so you'll just have to imagine an empty footed copper bowl/pot as the ‘before'. It was sitting empty in my dining room as I unpacked all my Christmas ornaments this year and…well…the rest is history. …put gold candles in my silver candlesticks (gasp! )…and my Mixed Metals Table Setting was born. You know when something just comes together like it was meant to be…like Kismet? …that's how I feel about how easy this table came together. Now, I know that all this ‘mixed metals' stuff might be giving some of you the heebie jeebies…my daughter for one. She's one of those that can't wear anything silver if there is something gold in the same zip code. Me, on the other hand; I've always loved tossing all the metals together and letting them play and bounce off of each other. But to each their own; as my grandma always said, ”that's what make the world go 'round”. But, back to the table. If you saw my Thanksgiving Table, or my Christmas Brunch Table in my recent home tour…you'll probably notice that the same dishes keep appearing. Not only do absolutely love the design and endurance of my Juliska dishes, but they just seem to accommodate whatever I ask them to do. Which is no small feat…just ask Terry. The name tags on the cookies I created simply by writing everyone's name using a glue pen and then sprinkling it with extra-fine copper glitter. A quick note about the glitter…I found many to be more orange than copper. The one I linked to is the exact one I used and is a lovely true copper. If you'd like to refer back to this mixed metals table setting, then bookmark this page or save it to pinterest for your future reference. So, are you ready for more table decorating inspiration? Do take a few minutes today or over the weekend to stop by and visit each of these lovely ladies and their dining rooms. You won't be disappointed. And many thanks again to Chloe at Celebrate and Decorate for hosting us all. Lovely mixed metals! The shine and glitter of the metal items with the crystal makes a beautiful table. Love your plates! Hi Carole, It was pretty lovely to see all the reflections off of the crystal when all the candles were glowing! Thanks for coming by my friend. Merry Christmas. It’s a pleasure being on this circuit with you, and I look forward to seeing more of your posts! Happy Holidays! Totally unique. I haven’t seen others who made use of the copper or copper-color in their Christmas decorating. So lovely! What a wonderful addition to the many choices for decorating. You made it look so classic and elegant. I love the copper pot as the centerpiece. Pairing it with all of the silver and white details makes for a gorgeous table! So beautiful! Merry Christmas to you and your family. Hi Marsha and thanks for your kind comments. I am a firm believer in kismet and I do believe that kismet led me to that great copper pot, which then was the impetus for the whole table. Lynn I am swooning over your mixed metals! I LOVE mixing them and you did an outstanding job. It is beautiful. I love that you check out the thrift stores and find just wonderful items. I love your centerpiece, it looks as if it came out of one of the famous magazines! The dinnerware is perfect too! Great job and welcome to the blog hop. Merry Christmas from our home to yours. Hi Kari, I’m thrilled to be here and to have the opportunity to meet all of you lovely ladies. I am happy with how it turned out and looking forward to getting great use out of it from now through New Years. Favorite Table this year by FAR ! Its sooo Beautiful! Great Job! I’m a first time reader and will be back! Merry Christmas! Oh Barb, thank you so much for those lovely comments! I do love how it turned out…right now I’m pretty thrilled that I was able to get the wax I spilled all over my table cloth out! Going to iron it tomorrow and put everything back in place, where it will stay til after New Year. I’m so glad to meet you and thrilled to know you’ll be on the other end of my posts. Merry Christmas and Happy Holidays my friend..
Gorgeous Lynn! What a wonderful way to celebrate the elegance and sparkle of the season! And matching cookie favors~ how fun! Merry holidays! Lynn, this tablescape is stunning! It is both beautiful and elegant with its mix of metals. I love your dining chairs! It has been so much fun blog hopping with you! I hope that you have a happy and blessed holiday season! Thanks so much Shannon! I am quite thrilled with it too..well, until I spilled one of the votive candles all over the table cloth and am now struggling to get all that wax out! But think I’m on the right track. Wishing you a wonderful and magical Christmas as well my friend. Love the mixed metals. Looks fantastic! I’m from Australia and I really enjoy your posts. Have a happy and loving Christmas and a healthy and happy New Year. I will continue to read you posts with much enjoyment! Oh Kathryn, it is so nice to connect with you across this vast ocean! I am truly loving that mixed metal look as well. I had to take it down to wash my linens after a recent party and I’m anxious to get it all back up…ASAP! Wishing you a fantastically Merry and Wonderfilled Christmas and a happy and healthy new year as well my friend. You had me at your first pic of this fantastic tablescape! What a gorgeous centerpiece you have come up with – if mixing metals looks this good, I’m all for it. And you’ve coordinated the rest of the table wonderfully with it – from the dishware, to the candlesticks to the pretty copper coloured votive holders, all so pretty! And if that wasn’t enough, you made glittered placecards tied with that matching ribbon on the yummy looking cookies! While the tablescape is terrific, it’s your photography that has really captured the true feeling of the room and it all looks very inviting! So enjoyed my stop here on the Blog Hop! Going back to pin! I love your mixed metals approach for the holiday table. It creates such an elegant table that truly sparkles! And your daughter…maybe this beautiful table will convince her! Happy holidays friend! Very creative and fresh ideas! Thanks for sharing. Lynn, I love the look of the different metals! I really love how you worked your cookies and place holders with the rest of the table. Everything looks marvelous, my friend! Wishing you a Merry Christmas! 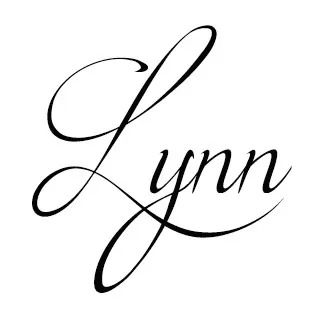 Swoon Lynn! 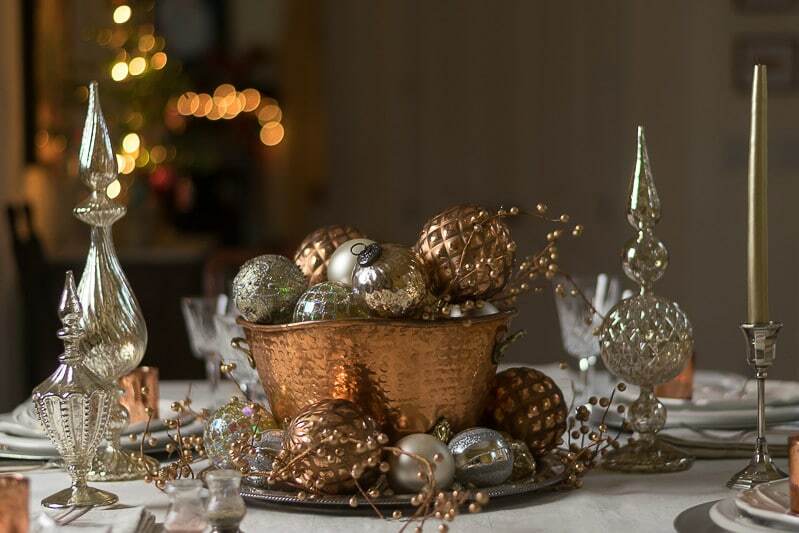 Your mixed metals table setting is so elegant and breathtaking… perfect for the holidays through the New Year. I love the organic nature of your centerpiece, the sparkling mercury glass finials and glow of the candlelight. Your photography is wonderful and I love the beautiful bokeh! Merry Christmas to you! Wow, thanks for all your kind comments Mary. I am having a ball pushing myself with this camera so your compliments are very appreciated. Wishing you a wonderful Christmas my friend. 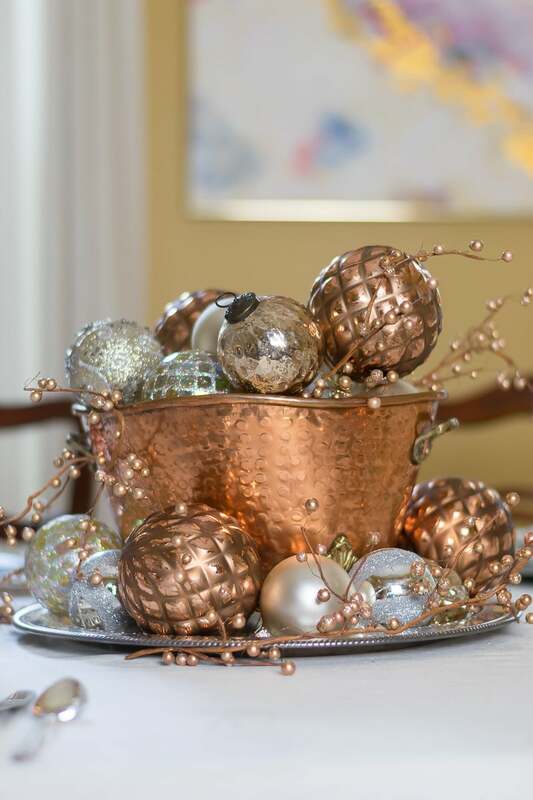 Lynn, Your copper accents are just lovely on this tablescape! From the hammered copper centerpiece to the beautiful pattern on the salad plates. I also loved the copper glitter lettering on your place settings, what a personal touch! I am loving all of the copper!! What a beautiful table! I like all the mixed metals, your comment about your daughter made me laugh!! The cookies at each place setting are so special. It’s been a pleasure doing the hop with you and learning about you and your blog. Merry Christmas! Hi Ann, thanks so much for your kind comments. My daughter and I see eye to eye on many things, but not mixing metals! Lynn, first I love the Juliska, classic and timeless! I also am crazy for mixing metals and you did it beautifully! I absolutely adore your table! It has been fun blog hopping with you this week! What a beautiful mix for your holiday table! Love the way you combined every detail! What an elegant, classy and glamorous tablescape you have here. And what a better time to do it up but the holidays. I love the way you mixed so many different elements together in a way that totally works.